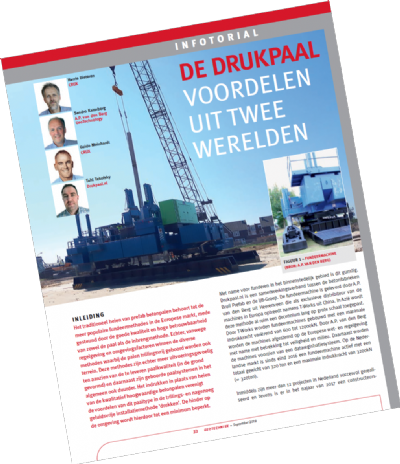 The traditional driving of precast piles still dominates the European market, partly supported by the high reliability of both the pile as well as the input method. 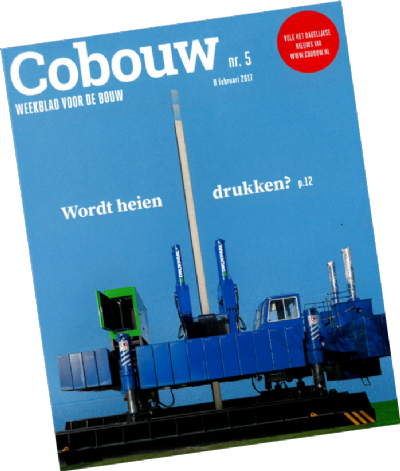 However, because of regulations and environmental issues the various methods that form the piles in the ground also become more popular. Yet, these methods do not provide the same high quality pile as the precast foundation pile. Pushing instead of driving the high quality precast concrete piles unites the advantages of the piles with those of pushing. Noise is reduced to a minimum and no vibrations are caused. In particular in urban areas this is favorable. 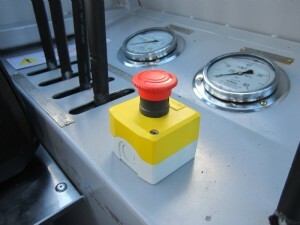 Watch via the button below a movie of our Dutch customer Drukpaal.nl. In Asia this method has been successfully used for over a decade. 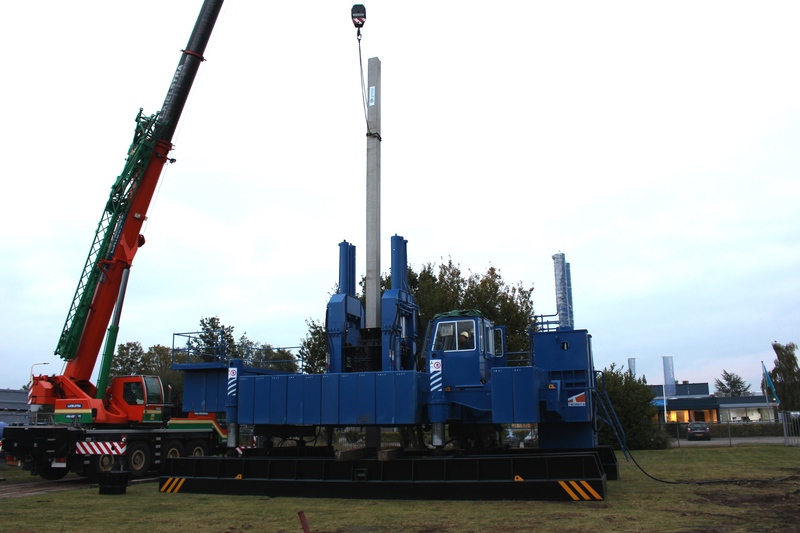 Machine builder T-Works from Changsha, China, has delivered more than 1,000 hydraulic pile pushers. The design of the T-Works machines is protected by several patents which strengthens their market leadership. We are for T-Works the exclusive distributor of the pushers in Europe and adjust the machines from China to the European legislation, especially concerning safety and the environment. 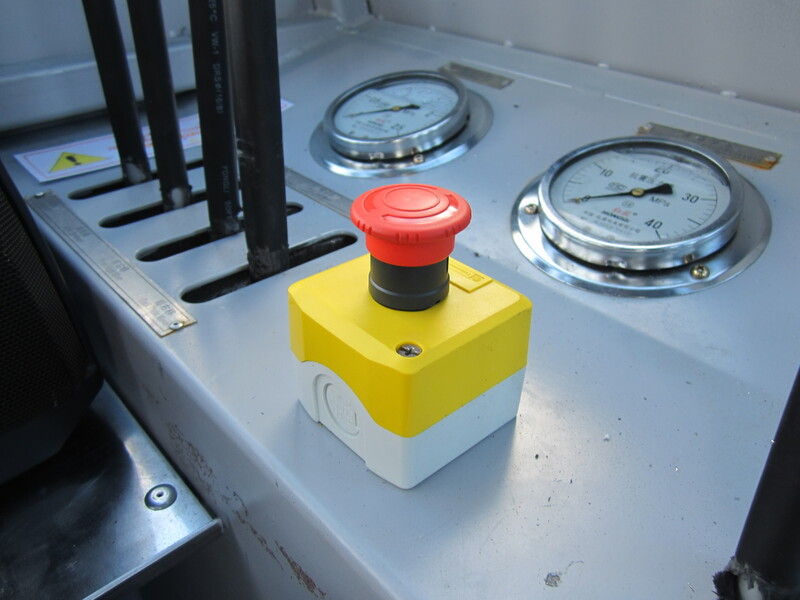 The result is a pusher that meets the Machinery Directive and has the required CE-marking. The machines are available in various models. The maximum pushing force and actually the overall weight of the machine, determines the configuration and dimensions. The total weights range from 60 tons to 1200 tons. 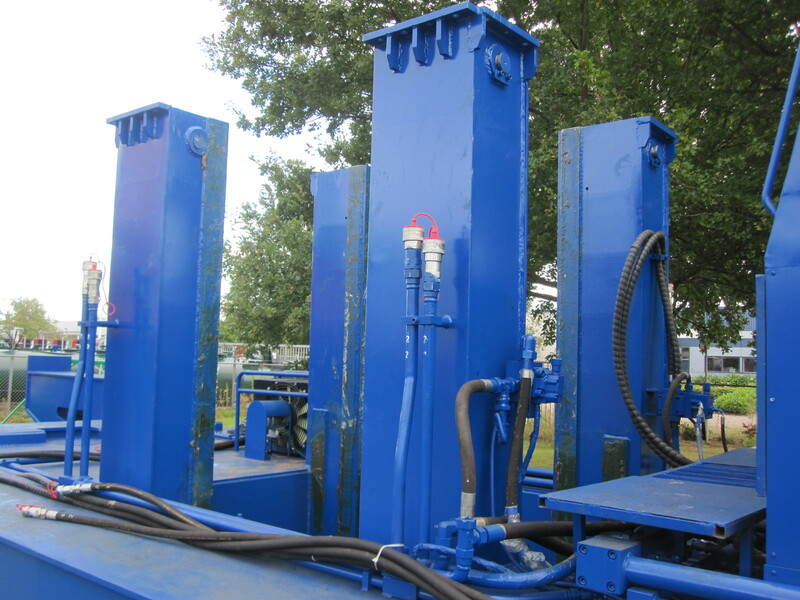 Each hydraulic pile pusher consists of a large steel base frame that can be stamped by four cylinders on two long beams. 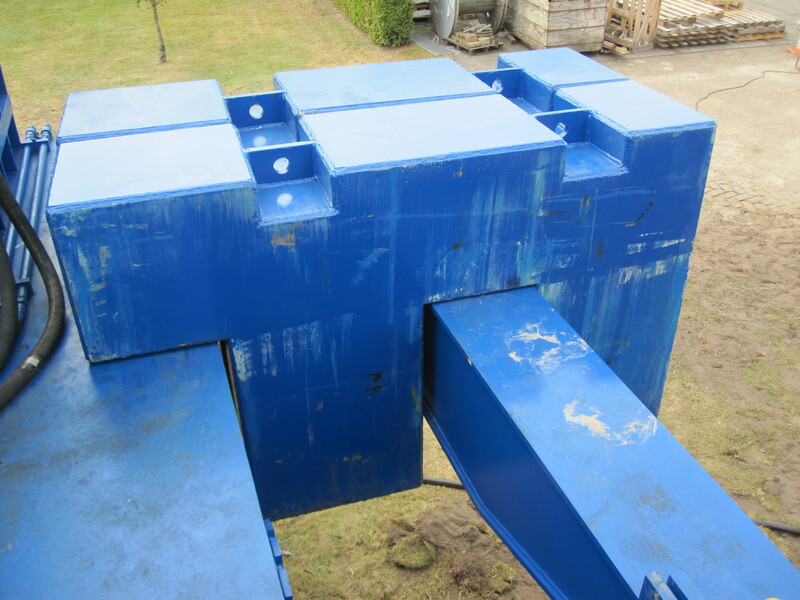 Also two smaller intermediate supports are integrated, with which the machine can be stamped independently of the cross beams. The base frame is provided with a cabin from where the machine is being controlled. 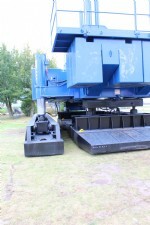 A pushing mechanism in the center of the machine is supplied for pushing the pile. 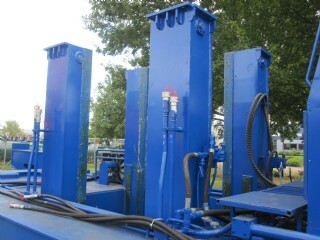 The pushing mechanism consists of a hydraulic clamp to hold the pile and four hydraulic cylinders providing various pushing forces and strokes of approximately 2 meters. 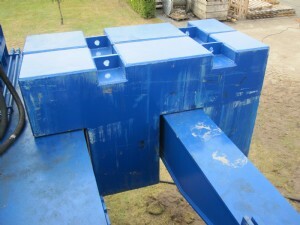 The clamp can be set by clamping blocks for several round or square pile diameters or even piles of a different shape. A generator set drives the electric motors. This generator set of course meets the Euro standards that apply for the machine. 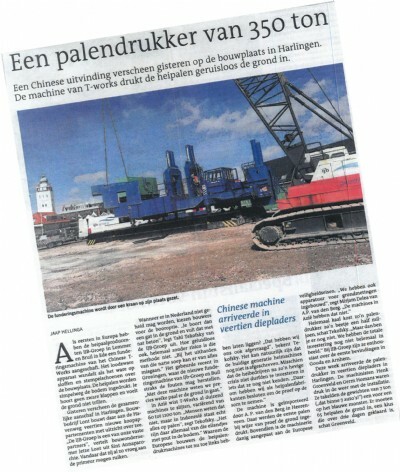 Unlike models sold in China, the European model does not have a crane or other lifting facilities "on board". This is equipment that can better be provided by local specialist suppliers and usually a crane is on site anyway to handle the piles. 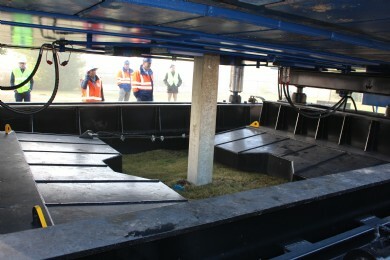 The long boats comprise a rail construction in which the base frame can move back and forth in the longitudinal direction above the sleepers. 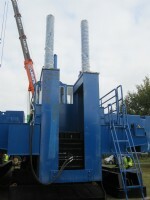 This allows the machine to manoeuvre from pile to pile position. Stamped on the two intermediate supports the long boats come free from the ground and the machine can also move in transverse direction. The long boats relative to the base frame can be shifted in longitudinal direction. 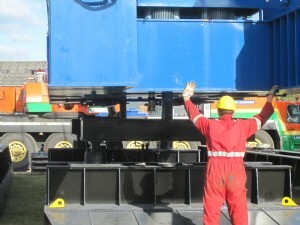 By alternately stamping on the short boats and the intermediate supports, the machine can move aside on the project location. Watch a movie of T-Works here, that gives more insight into the structure of the machine and the moving. The main machine has quite a weight of its own, but in order to optionally increase the pushing force the machine is made heavier by a flexible number of counter weights. These counter weights have such a form that they are easily and safe placed on the machine. Each model has, of course, a maximum allowed weight based on the maximum pushing force for which the machine is specified. After shipment, the machine has to be assembled using the instructions and maybe with help of our employees. 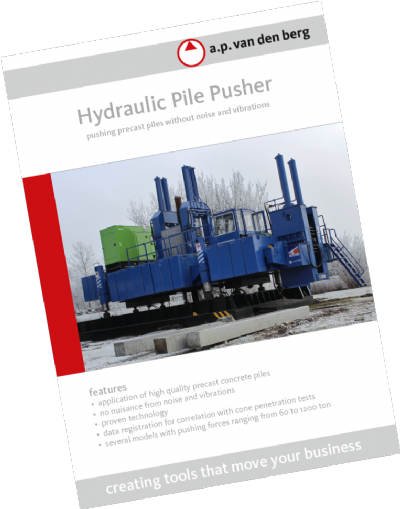 This takes one or two days, after which a training can be given in working with the hydraulic pile pusher. Depending on the size of the machine, some of the basic elements should be removed for transport. 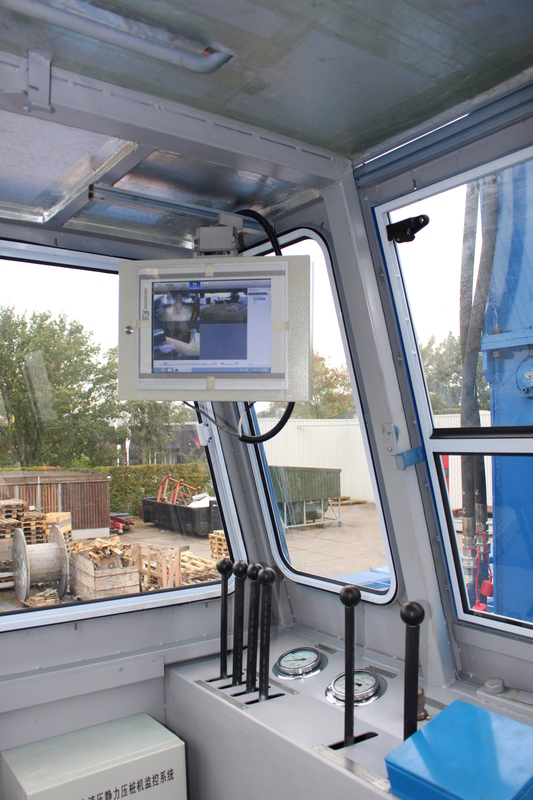 Each machine has data registration equipment on board that captures the depth and pushing force of each pile during pushing. Futhermore it is possible to acquire detailed information about the soil simultaneously with pushing a pile, by performing CPTs in front of the pile. 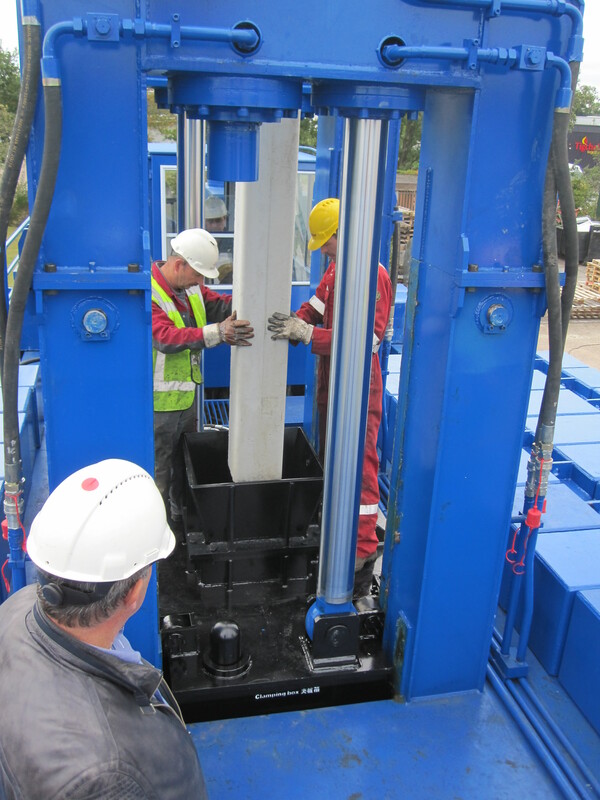 This allows a comparison with Cone Penetration Tests and the pile plan and delivers per pile a sample of load capacity. 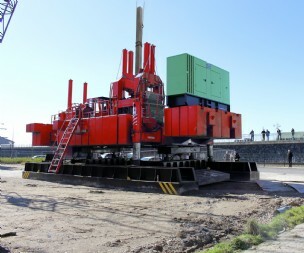 Esspecially for pushing precast foundation piles on the side of the working field or close to adjacent structures, a second pushing system on the side of the machine is available which provides 50% of the central pushing system its power. T-Works' and our years of experience in assembling machines together with the drive to stay ahead in the market, ensures a continuous improvement of the design. 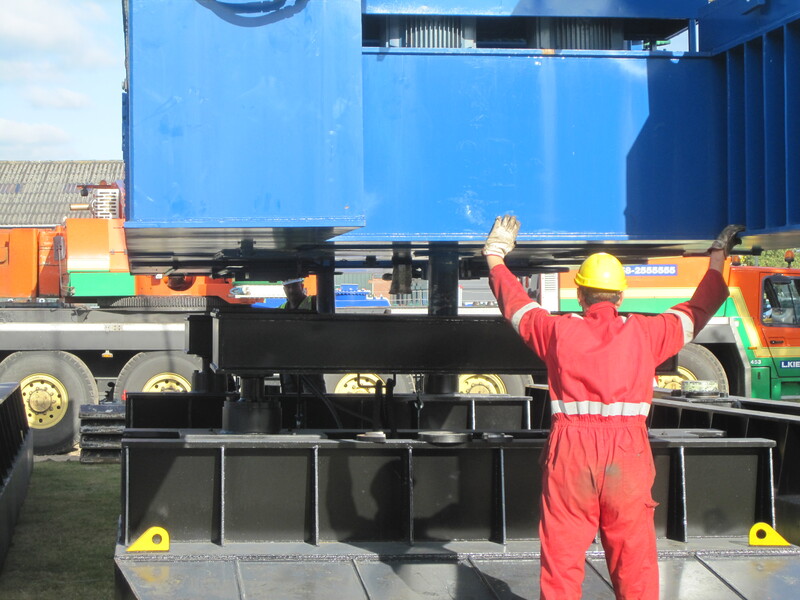 Reliable durable materials are used and the machine is easily and quickly built up, transported and maintained. Top priority of both T-Works as well as A.P. 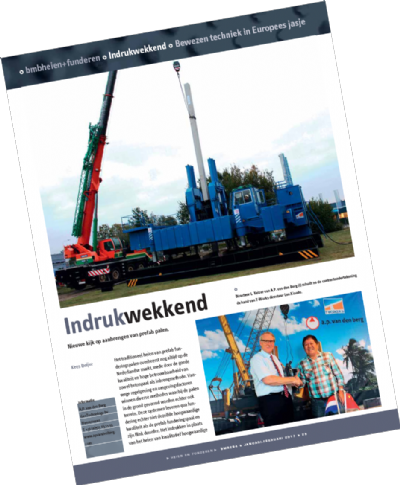 van den Berg are aftersales and service. 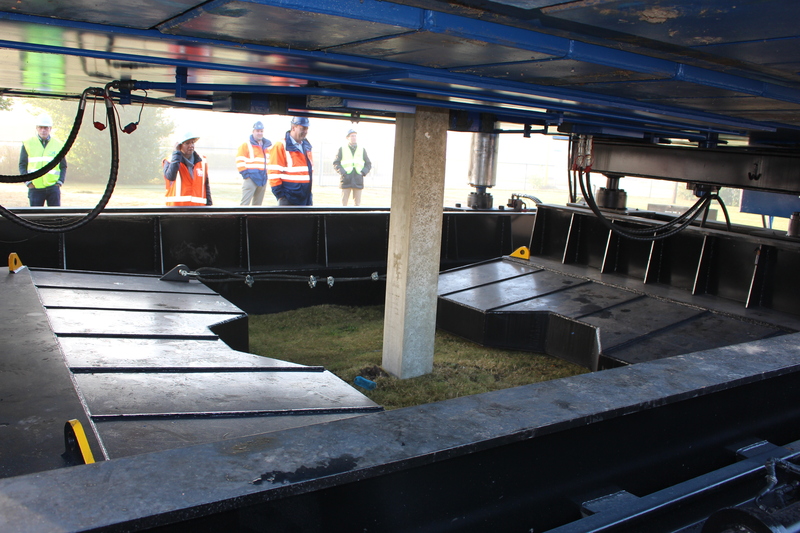 This is reflected in an extensive training and installation assistance on site. Also quick assistance is provided when problems occur in the field. The pushing machine can be composed as required. 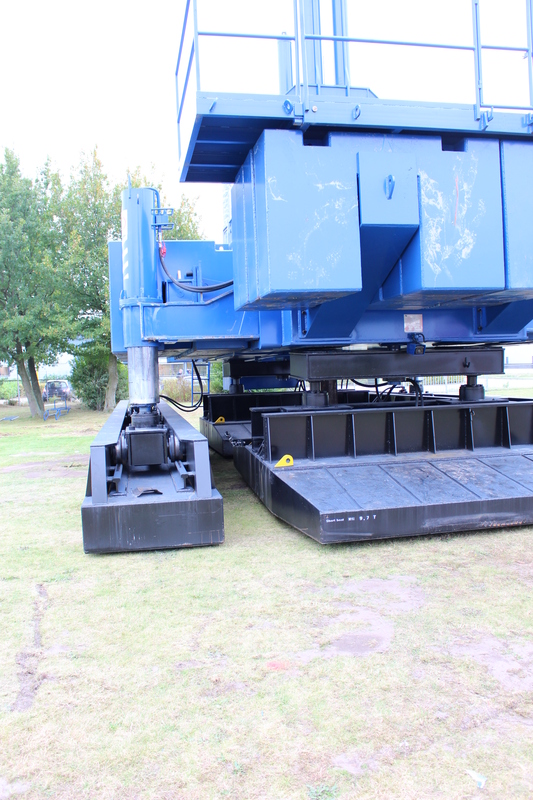 It is available in 14 different models with capacities from 60 to 1,200 tons. 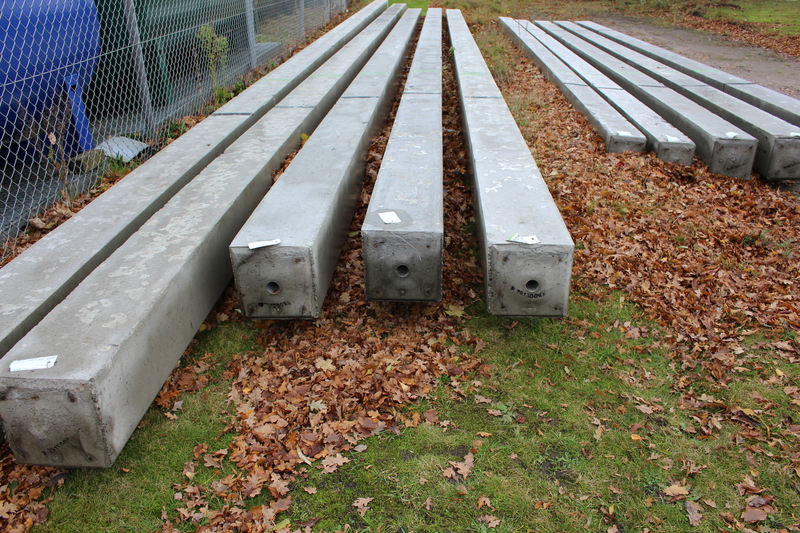 Different sizes and shapes of precast concrete piles can be used.